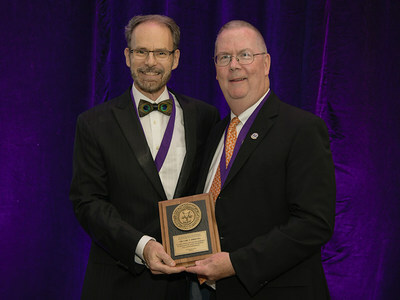 CHICAGO, /PRNewswire/ -- The American College of Prosthodontists (ACP) is pleased to announce Carl F. Driscoll, DMD, FACP, as the recipient of the 2018 Educator of the Year Award. This award recognizes exceptional skills as a dental educator and outstanding contributions to academic and professional dentistry. "There are so many great educators in our profession, so I am appreciative that I was selected for this award," said Dr. Driscoll. "While I am the recipient, I truly believe this is a team award that recognizes all of the residents and faculty that I have been blessed to work with over the course of my career." Beloved by generations of dental students, Dr. Driscoll received the award for his dedicated service at the University of Maryland Dental School, including 21 years as Director of the Prosthodontic Residency program. Dr. Driscoll also spent over twenty years with the U.S. Army, retiring at the rank of colonel, and serving as Program Director of the Prosthodontic Residency at the Walter Reed Army Medical Center. Dr. Driscoll has held many leadership positions within the prosthodontic community, including serving as president of the ACP in 2016. He has given over 400 invited lectures nationally and internationally, authored over 75 publications, is a Fellow of the ACP, and a Diplomate of the American Board of Prosthodontics. Dr. Driscoll received his DMD from Tufts University Dental School before completing his residency and Certificate in Prosthodontics from the Letterman Army Medical Center. He also completed a fellowship in Maxillofacial Prosthodontics with the Naval Dental School at Bethesda, Maryland. A prosthodontist is a dental specialist who focuses on the restoration and replacement of missing teeth and other oral or facial issues. Prosthodontists specialize in helping patients with implants, dentures and veneers, all the way to full mouth and jaw reconstructions.